The establishment of latent infections in sensory neurons accounts for the widespread dissemination of life long Herpes Simplex Virus type 1 (HHV-1) infections in humans. In productive cells, viral VP16 and cellular HCF1 associate with OCT-1 and activate the transcription of Immediate Early (IE) genes. 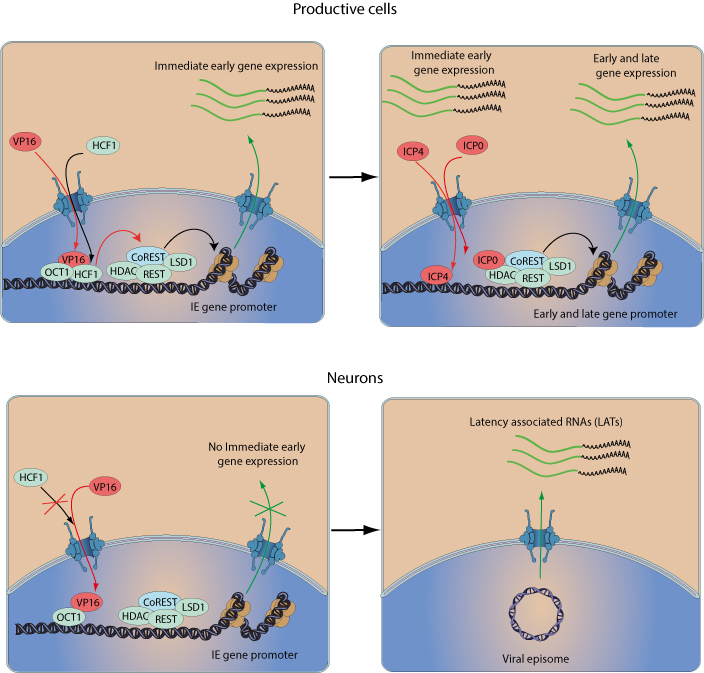 Then, ICP0 acts on the REST/CoREST (a chromatin modifying complex that represses neuron-specific genes in non-neuronal cells) and thereby activates the transcription of early and late genes. In neurons HCF1 is only present in the cytoplasm and VP16 cannot activate IE gene transcription. Instead, the viral genome becomes circular ans transcribes a set of RNAs called LATs to maintain latency. Reactivation correlates with neuronal stress, the sole period where HCF1 is localized to the nucleus.